The suspects are plentiful. More than a handful of people could have wanted him dead. Retained by Taylor’s widow, Coop works alongside his best friend and Chief of Detectives, Ben Mason. The investigation leads Coop and Ben to visit the luxurious mansions of recording industry magnates, navigate the murky undercurrents of the political world, and probe complicated family matters. Scandalous indiscretions, secrets, and hints of corruption swirl in the midst of their pursuit of the killer. Coop’s faithful friend and assistant, Annabelle and his loyal golden retriever, Gus, both lend a hand during the investigation. Even his Aunt Camille mines the local gossip mill to unearth potential killers with motive. Yet the case seems hopeless until a crucial piece of evidence emerges that sends Coop and Ben on a race to catch the killer before someone else dies. 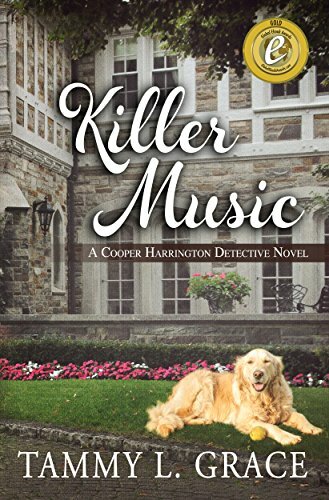 In this installment of the Cooper Harrington mystery series, Coop and his police buddy Ben have to solve the murder of a recording studio executive. As you would expect, there are more than enough suspects, including the angry artist, the jilted lover, and maybe even the angry wife, to keep them guessing up to the end, and the reader right along with them. Killer Music is a well-paced procedural / cozy with realistic, likable characters. We are lucky enough to have Cooper himself here for a chat today – read on to see what he has to say! My name is Cooper Harrington, but everyone calls me “Coop” and I’m a private investigator based in Nashville, Tennessee. I’m the main character in the Cooper Harrington Detective Novels, by Tammy L. Grace. Do you have any weaknesses or bad habits? What? No small talk? Oh, yes, I have a few. Off the top of my head, I tend to overindulge in coffee. I’ve been told I can be sarcastic. Apparently, I have a commitment problem when it comes to women. I can’t seem to find the right one. I don’t easily forgive, especially when it comes to my mother. Overall, I’m in good health. My right-hand, Annabelle, or “AB”, is doing her best to help me comply with my doctor’s recommendations to cut back on coffee and peanut M&M’s. She’s also forcing me to go to the gym in the mornings. I need to do a better job and I could be healthier. I also have suffered from chronic insomnia for years. Tell us about a defining moment in your life? That’s a tough one. I think when Uncle John died would be a day I label as a defining moment. I had worked with him while I attended Vanderbilt University. He was a career police detective and when he retired he started Harrington & Associates. AB and I worked for him during our college years. We both graduated with law degrees and joined Uncle John. I discovered I enjoyed the investigative work even more than the law, but do both. When Uncle John died I took over the business. He was a great mentor and I still miss him, but do my best to honor his memory. I’m in my forties. Let’s leave it at that. That’s a complicated question. I am close to my dad. He lives in Nevada, where I grew up. I came to Nashville to attend college and lived with Uncle John, my dad’s brother, and Aunt Camille. They had no children and treated me like their own son. When I went away to college, my mother left my father and we’ve had a distant and rocky relationship ever since. I don’t see her often, which works for me. I haven’t forgiven her, which goes back to your earlier question about my weaknesses. It’s an unresolved situation and has been for more than twenty years. What’s your favorite beverage? Favorite food? Finally, an easy one. Coffee is my favorite beverage, but I’m cutting back and drink more decaf these days. I’m also a big fan of sweet tea. When it comes to food, I like too many things. One of my favorites is Aunt Camille’s chocolate pecan chunk cookies. They’re to die for. Do you have a favorite item of clothing? As a matter of fact I do. I have a collection of humorous t-shirts. AB says they’re snarky, but I think they’re funny. I tend to dress casually and wear one each day. I enjoy finding new ones to add to my collection. That would be my golden retriever, Gus. He’s my best buddy and always makes me smile. He’s a bit spoiled. He’s got his own leather chair in my office and even has a dog bed in the office of my best friend, Ben, who happens to be the Chief of Detectives in Nashville. I drive a vintage Jeep. Gus loves to ride with me and is always in the passenger seat, unless AB is with us. My first thought goes to food. I love the smell of coffee and bacon and my aunt’s Sunday suppers. How about your favorite music? I’ve lived in Nashville for over twenty years…country, of course. Is there anything in your past you’d like to forget? I’d like to forget the feeling of betrayal when my mom took off. I don’t think about it much, probably because it’s too painful. What are the last five entries in your checkbook? Hmm…I tend to pay with my card more than checks. So, I would say credit card payments, but I don’t think I’ve written a check in ages. I pay most things online, or should I say AB does. She manages the office and handles my personal accounts. If we saw you at the grocery store, what ten items would you have in your cart? I’m not much of a shopper. I don’t know that I’ve ever had ten items in a cart, or even a cart. I’m a bit spoiled myself. I still live with Aunt Camille. She’s got a large estate and I have my own wing in the house, complete with a home office. Aunt Camille has a housekeeper who takes care of all the shopping. Usually I run to the store only if I’m out of something like shaving cream or deodorant. You’re more apt to find me picking up donuts or lunch than actual groceries. Do you run from or embrace conflict? I’m a lawyer, what do you think? Like one of my favorite shirts says, “I’m not arguing, I’m just explaining why I’m right.” My business is full of conflicts and it’s one of the things I enjoy most about my work. Yes, I would say I’m honorable and trustworthy. I sometimes might bend the rules a little, but it’s always in pursuit of the truth. I work to do the right thing and do my best to help those who need it most. Aunt Camille is my only family in Nashville and ranks at the top of my list. She’s a bit nosy when it comes to my cases, but I’d be lost without her. AB and Ben have been my closest friends since college and I think of them as family and count them as two of the most important people in my world. My dad and brother are also foremost in my mind, but I don’t see them often, as they both live thousands of miles away. Thanks for spending some time with us, Coop. Anything you want to add? It was a pleasure. I would encourage your readers to give my series a try. If they like fast-paced whodunits, in the style of the Hallmark Mystery Movies, I think they’ll enjoy the series. I was honored to have the first book, KILLER MUSIC, win the 2016 Gold Medal in the Global E-Book Awards. Readers have told us the second book, DEADLY CONNECTION is even better. If your readers enjoy them, I’d be grateful if they left a positive review on Amazon. It always makes my day to read a flattering assessment. 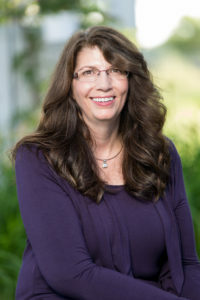 Tammy L. Grace is the award-winning author of The Hometown Harbor Series of women’s fiction set in the picturesque San Jan Islands in Washington and a mystery series set in Nashville, Tennessee, featuring Cooper Harrington, Private Detective. Born and raised in Nevada, Tammy L. Grace loved reading at a young age. With the help of her middle school teacher, she discovered the joy of writing. When Tammy isn’t working on ideas for a novel, she’s spending time with family and friends or supporting her addiction to books and chocolate. She and her husband have one grown son and a spoiled golden retriever. Next > June is Audiobook Month – Listening Suggestions and a Giveaway (ENDED)! Thanks for reading, Pearl. Enjoy! Unique interview and I enjoyed it. Have to find some of the books. Thank you for the introduction to Tammy L. Grace and her book. It always wonderful to find a new author and book to enjoy in these hot days of summer. You are welcome – and thanks for stopping by! Thanks for taking the time to learn about my books. Thanks so much for hosting us today, Erika. Coop and I had a great time with you!